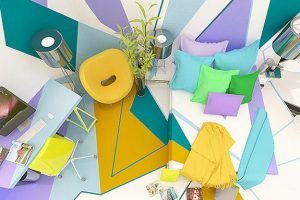 Modern interior decorating color schemes are an important part of interior design, and there are many color combinations to consider for paint, wallpaper patterns, furniture and decor accessories. Each room can have personality defined by its function, comfortable furnishings and a beautiful interior decorating color scheme…. White and yellow cream room paint colors work well with brown color shades, creating welcoming and light interior design, and offering warm and cozy room decorating ideas. Orange paint and bathroom accessories, combined with white, brown, blue and pink tones, offer stylish bathroom decorating color schemes for creating cheerful modern bathroom decor. Elegant gray color schemes, functional bathroom accessories and simple decorating ideas create comfortable masculine bathroom interior that feels tranquil and relaxing. Nature inspired white, brown and green color combination, natural materials, floral and leaves motifs and green plants are perfect ideas for eco style bathroom decorating. Creamy white, gray and purple color combination is a perfect choice for romantic, stylish and soft bathroom decorating ideas, that include modern bathroom decor accessories, inspired by flowers decorating theme. White-blue-red color combination, stars and stripes are modern decorating ideas for patriotic decoration for National holidays in spring and summer, Memorial Day and 4th of July celebration.